Is this unique to my system? I'm not familiar with fonts in "px". I've seen it before, somewhere, but can't remember ever using it, and have no reference to it that makes any sense to me. The dropdown box in your screenshot is actually the text leading/line height, but you do also get font sizes in px. The px measurement is pixels. Usually you’d use pt for measuring type for print, but in web design a lot of type measuring is done in pixels so as to get consistent sizes on different screens. I believe it’s showing up because you’ve set your document units to be measured in px, which is a new feature added in the beta. If you want to change it back to pts you can either change your document units to pts in “File > Document Setup > Document Units”, or in “Preferences > User Interface” there should be a checkbox for text sizes in points. Dear devs. Please put the switches for modes of font size definition somewhere in the fonts editing palettes. And please make points the default choice, always, regardless of anything else. 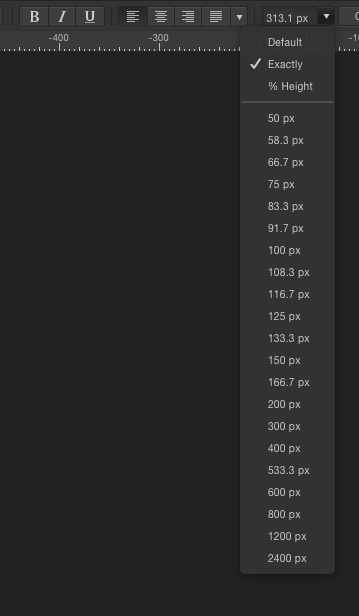 Points are the default method of describing font sizes in all mediums, now. Thanks Apple, Postscript, and even Google's Material "design".